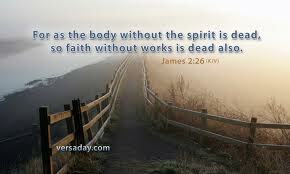 In this passage we see that faith is like the body and works is like the spirit that gives life to the body. The word “Works” simply means corresponding action that indicates that you actually believe. So the question is: How do I apply “works” or “spirit” to my faith to insure that my faith is a living faith? The answer is found in 2 Corinthians 4:13. The “Spirit of Faith” or “works” that bring life to your faith is simply speaking the answer you find in God’s word, declaring that you have (present tense) what you are believing for. For instance; you are the righteousness of God in Christ, so you should be declaring “I AM RIGHTEOUS!” You should be declaring the Word of God concerning that truth. 1 Peter 2:24 is one among many scriptures that emphasize this truth, and it is a good place to start. 1 Peter 2:24 (NKJV) who Himself bore our sins in His own body on the tree, that we, having died to sins, might live for righteousness—by whose stripes you were healed. This makes folks extremely uncomfortable because they feel like they are lying. It seems like foolishness to them. They don’t understand the power of their words or the scriptures. FURTHERMORE, THEY DON’T UNDERSTAND THE OPERATION OF FAITH. You see, God established this method of believing and speaking and He expects his children to follow His example if they are to have a living Faith. If we do not follow his example and be “DOERS” of THIS word … we enter into self deception. Notice that the devil does not get credit for this deception, YOU DO, by not submitting to the truth. 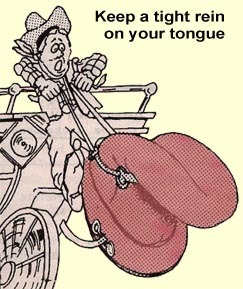 You MUST take control of your OWN TONGUE and FORCE it to do its due diligence. Here we see that “self deception” again. However, we can BRIDLE our tongues the same way we bridle untamed horses and force them to do our bidding. When I was a little boy, our neighbors had horses. One of the horses was named Sate. (short for Satan) Sate was an untamed, and unruly horse, yet every time my neighbors would go riding, the owners son would always choose Sate to ride. When he would initially get on Sate, the horse would buck, and jump, and squeal, throwing a fit because he didn’t want to be ridden. After a few minutes of fighting, and sometimes bucking the young man off, the bridle in Sate’s mouth would begin to make an impression on Sate and begin to control him. After that Sate could be ridden without a problem. A bridle is like power steering on a horse, and our tongue is like power steering for our life. We must treat our tongue in the same manner as my neighbor treated that horse. We must force ourselves to say the right things. This must be a lifestyle for us as Christians. If we aren’t catching, and correcting ourselves all the time in what we say we are not even trying. If we aren’t trying, we aren’t growing in our faith. We must make a decision to ONLY say what God has said about us. WHY? Because the power of life and death rests in one of your members that is an untamed beast! We can’t tame that beast, BUT WE CAN BRIDLE IT AND MAKE IT BEHAVE! We have our hands full keeping our faith alive, because we have our hands full controlling our tongue. The good news is that the number one way that you apply works (spirit) to your faith is speaking the Word. In many instances, it is the only action required for you to get results with your faith. As we declare the promises of God they become established in our heart and soon are manifest in the physical realm. In the process of growing in your ability to bridle the tongue I have three sayings that will help you stay on track if you apply them to your life. 1) When you speak, make sure it is an improvement on silence. 3) Give your heart time to tell your mouth what to say. If you can practice these three things you are on your way to bridling your tongue and keeping your faith ALIVE.